Limes are grown on trees that flourish in tropical and subtropical climates. They originated in Southeast Asia. Arab traders brought lime trees back from their journey to Asia and introduced them into Egypt and Northern Africa around the 10th century. The Arabian Moors brought them to Spain in the 13th century and then, like many fruits, they were spread throughout southern Europe during the Crusades. Persian which are known as Bearrs. Choose limes that are firm and heavy for their size, free of decay and mold. 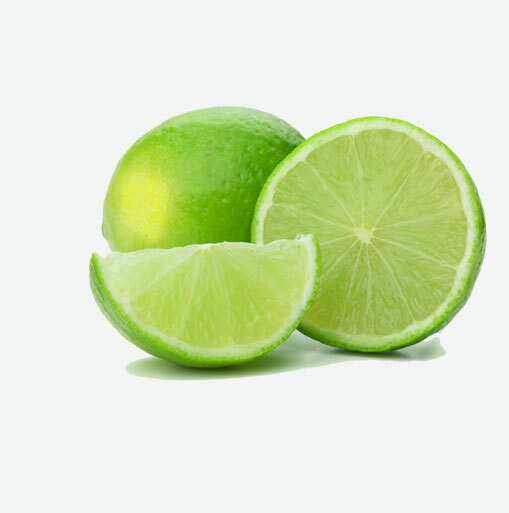 They should have a glossy skin that is deep green in colour; although limes turn more yellow as they ripen, they are at the height of their lively, tart flavour when they are green in colour. Limes can be kept out at room temperature where they will stay fresh for up to one week. Make sure to keep them away from sunlight exposure since it will cause them to turn yellow and will alter their flavour. Limes can be stored in the refrigerator crisper, wrapped in a loosely sealed plastic bag, where they will keep fresh for about two weeks. • Used for its pickling properties in ceviche. • Leaves of the Kaffir lime are used in Southeast Asian cuisine..
• Use of dried limes as a flavouring is typical of Persian cuisine. They will produce more juice when warmer, so always juice them when they are at room temperature. Roll them under the palm of your hand on a flat surface. Before cutting the lemon or lime in half horizontally through the center, wash the skin so that any dirt or bacteria residing on the surface will not be transferred to the fruit’s interior. You can either use a juicer, a reamer or do it the old fashioned way, squeezing by hand. For lime zest, make sure that you use fruit that is washed to remove as much residue from the fruit. Make sure not to remove too much of the peel as the white pith underneath is bitter. Substitute fresh limes or freshly squeezed lime juice in any recipe calling for lemons. Squeeze a bit of fresh lime into any non-creamy soup for a lively, bright flavour. Add lime cartwheels, wedges and twists to carbonated beverages and iced tea. Add lime zest to butter to dress plain vegetables or grilled meat, fish and poultry.